Abstract. Modeling the interaction of dust with long-wave (LW) radiation is still a challenge because of the scarcity of information on the complex refractive index of dust from different source regions. In particular, little is known about the variability of the refractive index as a function of the dust mineralogical composition, which depends on the specific emission source, and its size distribution, which is modified during transport. As a consequence, to date, climate models and remote sensing retrievals generally use a spatially invariant and time-constant value for the dust LW refractive index. In this paper, the variability of the mineral dust LW refractive index as a function of its mineralogical composition and size distribution is explored by in situ measurements in a large smog chamber. Mineral dust aerosols were generated from 19 natural soils from 8 regions: northern Africa, the Sahel, eastern Africa and the Middle East, eastern Asia, North and South America, southern Africa, and Australia. Soil samples were selected from a total of 137 available samples in order to represent the diversity of sources from arid and semi-arid areas worldwide and to account for the heterogeneity of the soil composition at the global scale. Aerosol samples generated from soils were re-suspended in the chamber, where their LW extinction spectra (3–15µm), size distribution, and mineralogical composition were measured. The generated aerosol exhibits a realistic size distribution and mineralogy, including both the sub- and super-micron fractions, and represents in typical atmospheric proportions the main LW-active minerals, such as clays, quartz, and calcite. The complex refractive index of the aerosol is obtained by an optical inversion based upon the measured extinction spectrum and size distribution. Results from the present study show that the imaginary LW refractive index (k) of dust varies greatly both in magnitude and spectral shape from sample to sample, reflecting the differences in particle composition. In the 3–15µm spectral range, k is between ∼0.001 and 0.92. The strength of the dust absorption at ∼7 and 11.4µm depends on the amount of calcite within the samples, while the absorption between 8 and 14µm is determined by the relative abundance of quartz and clays. The imaginary part (k) is observed to vary both from region to region and for varying sources within the same region. Conversely, for the real part (n), which is in the range 0.84–1.94, values are observed to agree for all dust samples across most of the spectrum within the error bars. This implies that while a constant n can be probably assumed for dust from different sources, a varying k should be used both at the global and the regional scale. A linear relationship between the magnitude of the imaginary refractive index at 7.0, 9.2, and 11.4µm and the mass concentration of calcite and quartz absorbing at these wavelengths was found. We suggest that this may lead to predictive rules to estimate the LW refractive index of dust in specific bands based on an assumed or predicted mineralogical composition, or conversely, to estimate the dust composition from measurements of the LW extinction at specific wavebands. 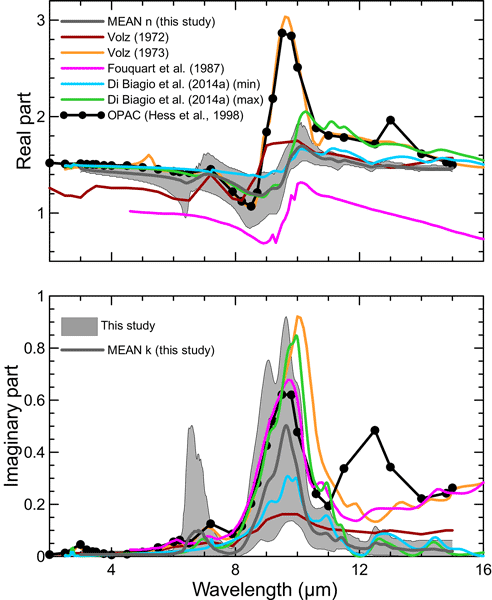 Based on the results of the present study, we recommend that climate models and remote sensing instruments operating at infrared wavelengths, such as IASI (infrared atmospheric sounder interferometer), use regionally dependent refractive indices rather than generic values. Our observations also suggest that the refractive index of dust in the LW does not change as a result of the loss of coarse particles by gravitational settling, so that constant values of n and k could be assumed close to sources and following transport. 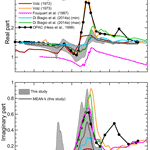 The whole dataset of the dust complex refractive indices presented in this paper is made available to the scientific community in the Supplement. How to cite: Di Biagio, C., Formenti, P., Balkanski, Y., Caponi, L., Cazaunau, M., Pangui, E., Journet, E., Nowak, S., Caquineau, S., Andreae, M. O., Kandler, K., Saeed, T., Piketh, S., Seibert, D., Williams, E., and Doussin, J.-F.: Global scale variability of the mineral dust long-wave refractive index: a new dataset of in situ measurements for climate modeling and remote sensing, Atmos. Chem. Phys., 17, 1901-1929, https://doi.org/10.5194/acp-17-1901-2017, 2017.